Despite the USSR's recently renewed interest in and emphasis on arms control, Soviet production of newer, more lethal strategic nuclear weapons continues. Even as the Soviets proceed with deployment of the SS-25 mobile intercontinental ballistic missile(ICBM), two new strategic ballistic missile submarines, and the flight-testing of a new strategic bomber, they are developing another generation of air-, sea-, and ground-launched nuclear-capable cruise missiles. The AS-15 air launched cruise missile is already operational on over 50 BEAR H bombers, and the SSC-X-4 ground-launched and SS-NX-21 sea-launched cruise missiles may become operational this year. These developments, along with the greater improvements in the accuracy, survivability, and lethality of the USSR's short-range ballistic missile force, underscore the Soviet Union's commitment to modernizing its large nuclear arsenal. The overall direction of Soviet strategic nuclear force development and associated command, control, and communications is toward a completely integrated force. All elements of their "triad" may eventually have a hard target-kill potential These developments are consistent with Soviet military doctrine. The Soviet Union now has about 10,000 deployed intercontinental strategic nuclear weapons (missile warheads and bombs) and by 1990 is likely to have about 12,000. While the Soviets would not necessarily expand their intercontinental attack forces significantly in the absence of arms control constraints, they have the potential to deploy between 16,000 and 20,000 strategic nuclear weapons by 1996. Moreover, this force will be significantly more flexible, survivable, and effective. Thus, both quantitatively and qualitatively, the Soviets will enhance their first-strike capability and their ability to fight a protracted nuclear war through the deployment of more accurate and survivable systems. In the land-based force, the development of the hard-target-kill SS-18 follow-on and a silo based SS-X-24, both probably more accurate and reliable than current systems, will significantly increase the lethality of the USSR's force. The rail-mobile SS-X-24 and the road mobile SS-25 will provide the Soviets with highly survivable systems for protracted operations. Indeed, the SS-25 may be the perfect reserve weapon for such a war. It has a single reentry vehicle and is thus easily retargeted. Perhaps the most notable growth will take place in the submarine ballistic and cruise missile force. By 1995, this force will grow from roughly 20 percent of today's Soviet strategic nuclear warheads to over 30 percent of an expanded force. This future submarine force will be quieter, more responsive because of better communications, and more effective. Supported by an extremely-low-frequency communications system, the DELTA IV could be almost as responsive as an ICBM for destroying time-critical targets. Submarine-launched cruise missiles will provide the Soviets with yet another weapon for US early warning and command-and-control systems to track. Strategic aviation is making a strong comeback in the Soviet Union. The BACKFIRE, the BEAR H, and in the near future, the BLACKJACK, will provide the Soviets with the ability to attack the US through multiple avenues. The Soviets will have the capability with the BEAR H and the BLACKJACK to launch hundreds of difficult-to-detect, hard-target-kill AS-15 cruise missiles. Moreover, the BLACKJACK will be able to conduct reconnaissance and strike operations in a nuclear war lasting beyond an initial missile exchange. Additionally, the Soviets are significantly upgrading the communications support to these forces. 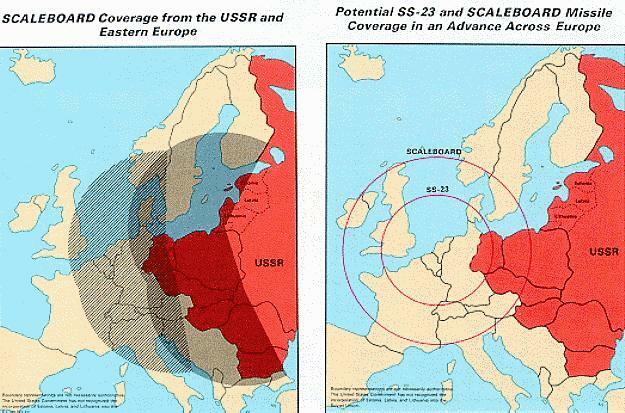 With the mobile SS-20 intermediate-range ballistic missile, each with three independently targetable warheads, the Soviets have maintained their nuclear strike capability against both the European and Asian theaters. At the same time, the mobility inherent in the SS-20 design has afforded a level of undetectability and survivability unmatched in previous systems. The system also has an inherent refire capability. Of the 441 SS-20 launchers now operational in the force, approximately two-thirds face NATO from the western USSR, and the remainder are deployed in the Soviet Far East. Instead of increasing the size of the already large SS-20 force, the Soviets will quite likely strive for better accuracy, nuclear lethality, and survivability. These technical improvements are already being integrated in a new, improved version of the SS-20 that could become operational in 1987. In addition to the threat posed by the SS-20 ballistic missile force, the Soviets continue development of a new class of mobile land-attack cruise missile the SSC-X-4 ground-launched cruise missile and the SS-NX-21 sea-launched version. When deployed later this decade, these missiles will add yet another dimension to the Soviet longer range intermediate-range nuclear forces (LRINF) threat to NATO and Asia. The new generation of cruise missiles will quite likely complement both Soviet bombers and SS-20s in the continental theaters surrounding the USSR, compounding an already difficult air defense environment in wartime target areas. Potential accuracy improvements in future cruise missile design will allow targets to be struck with greater precision than ballistic missiles are currently capable of attaining. Cruise missile deployment will also free a significant number of Soviet theater bombers now allocated for nuclear strikes to carry out missions such as attacks with chemical and improved conventional munitions. The Soviet Union is also making substantial strides in improving its sizable shorter range ballistic missile force. This force, which numbers more than a thousand launchers, is expected to grow steadily in the near term. The implications for the US and its allies reside not only in the numbers and the improvements that are forecast for missile accuracy and warhead options, but also in the potential employment of these missiles. The Soviet commander will be able to launch a devastating attack to the depth of the theater rear. The accuracy of the missiles and the potential of non-nuclear warheads will allow a reduced number of missiles to strike any single target with the same confidence of destruction formerly associated with significantly larger numbers of the older systems, and this combination could allow the Soviets to do so without crossing the nuclear threshold. 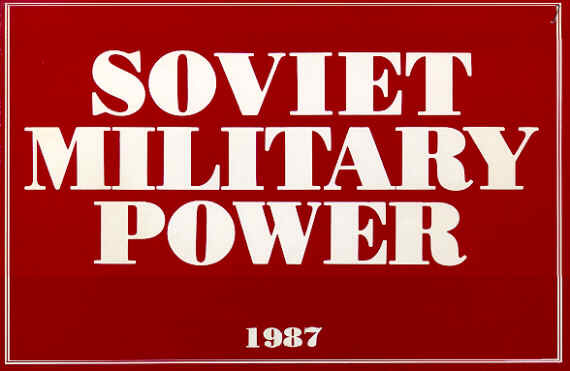 Soviet literature reflects an understanding of the need for target acquisition, analysis, and strike weapons to attack reserves; command, control, and communications structures; and the logistics infrastructure in a highly responsive manner. The constantly improving accuracy and warhead capability of the shorter range missile, its short flight time, and its relative invulnerability in flight make it an ideal strike weapon. The Soviets are expected to seek further refinements in targeting for these missiles. These weapons will remain a potentially devastating force against the West. - protection of the Soviet leadership and cadres,military forces, military and economic assets necessary to sustain the war and, to the extent possible, the general population. - varied and redundant communications networks. - satellite surveillance sensors, ground-based surveillance sensors, and related communications facilities. Soviet nuclear forces are designed and personnel are trained to fulfill their missions under all circumstances. Soviet leaders appear to believe that nuclear war might last weeks or even months, so they have included this possibility in their force planning. Despite their public rhetoric alleging their commitment to no first-use of nuclear weapons, the Soviets have developed extensive plans for using nuclear weapons first to preempt any use by other states. The keys to a successful first use of nuclear weapons would be accurate intelligence on enemy intentions and the effective coordination of the strike. Meeting these demands in war requires reliable command, control, and communications under all conditions. A launch-under-attack circumstance would place great stress on attack warning systems and launch coordination. To meet the demands of a launch-under-attack contingency, the Soviets have established an elaborate warning system. Satellite, over-the-horizon radar, and other early warning systems have been built to provide the USSR with the capability to assess accurately and to respond effectively to any nuclear attack. These warning systems could give the Soviets time to launch their forces very quickly. Follow-on strikes would require the survival not only of major weapons but also of command, control, and communications systems. The Soviets have invested heavily in providing this survivability. The SS-17, SS-18, and SS-19 ICBMs are housed in the world's hardest operational silos. Silo deployment has been adopted for ABMs as well. To increase its survivability, the Soviets designed the SS-20 LRINF missile to be mobile. The mobile SS-25 ICBM is being deployed and the development of the mobile SS-X-24 continues. The SA-X-12B/GIANT, with some capability against strategic ballistic missiles, is also mobile. The launch-control facilities for offensive missiles are housed in very hard silos or on off-road vehicles. Communications are redundant and hardened against both blast and electromagnetic-pulse damage. Higher commands have multiple mobile alternate command posts available for their use, including land vehicles, trains, aircraft, and ships. Bombers are assigned dispersal airfields. Operational ballistic missile submarines will be dispersed while being protected by surface, air, and submarine forces, while those not ready for deployment could be hidden in caves or submerged in deep fjords just off their piers. The belief that a nuclear war might be protracted has spurred Soviet emphasis on nuclear weapon system survivability and sustainability. 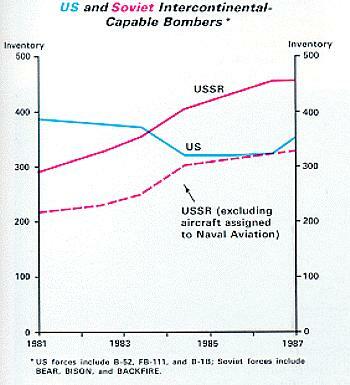 For their ICBM, LRINF, SRINF, SNF, SLBM, and air defense forces, the Soviets have stocked extra missiles, propellants, and warheads throughout the USSR. Some ICBM silo launchers could be reloaded, and provisions have been made for the decontamination of those launchers. Plans for the survival of necessary equipment and personnel have been developed and practiced. Resupply systems are available to reload SSBNs in protected waters. As part of these ambitious development and deployment programs, the Soviets continue to modernize all elements of their nuclear attack forces. At the same time, the leadership has been directing a campaign to support and to encourage antinuclear movements in the West to influence, delay, or frustrate Western nuclear force programs. The operational Soviet ICBM force consists of some 1,400 silo and mobile launchers, aside from those at test sites. Some 818 of the silo launchers have been rebuilt since 1972. Nearly half of these silos are new versions of the original designs and have been reconstructed or modified in the past 7 years. These silos contain the USSR's most modern deployed MIRVed ICBMs the SS-17 Mod 3 (150 silos), the SS-18 Mod 4 (308), and the SS-19 Mod 3 (360). Deployment of these most recently modifiability began just 8 years ago. 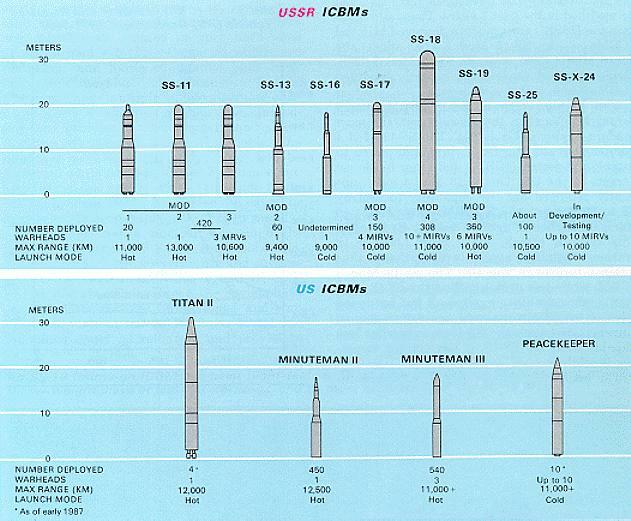 The highly accurate SS-18 ICBMs carry larger MIRVs than the Peacekeeper, the most modern deployed US ICBM. The SS-18 Mod 4 carries at least 10 MIRVs. It was designed to attack and destroy ICBMs and other hardened targets in the US. The SS-18 Mod 4 force currently deployed has the capability to destroy 65 to 80 percent of US ICBM silos using two nuclear warheads against each. Even after this type of attack, more than 1,000 SS-18 warheads would be available for further strikes against targets in the US. The SS-19 Mod 3 ICBM, while less accurate than the SS-18, has significant capability against all but hardened silos. It could also be used against targets in Eurasia. Although the SS-17 is somewhat less capable than the SS-19, it has similar targeting flexibility. The remaining Soviet ICBM silos are fitted with SS-11 Mod 2/3s and SS-13 Mod 2s. These older types of ICBMs are housed in less-survivable silos and are considerably less capable. Nonetheless, their destructive potential against softer area targets in the US and Eurasia is significant in terms of many of the Soviet requirements outlined above. 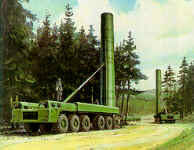 The most recent development in the Soviets' operational ICBM force was the deployment of the road-mobile SS-25 missile. The SS-25 is about the same size as the US Minuteman ICBM. 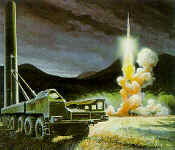 It carries a single reentry vehicle and is being deployed in a road-mobile configuration similar to that of the SS-20. As such, it will be highly survivable with an inherent refire capability. Bases for the SS-25 are operational and consist of launcher garages equipped with sliding roofs and several support buildings to house the requisite mobile support equipment. Deployment programs for all of the currently operational silo-based Soviet ICBMs are essentially complete. The command, control, and communications system that supports the Soviet ICBM force is modern and highly survivable, and the reliability of the ICBMsthemselves is regularly tested by live firings, including some from operational complexes. Some silo-based ICBMs in the current force that are not replaced with modified or new ICBMs will, in accord with past practice, be refurbished to increase their useful lifetime and reliability. During this process, some system modifications could also be made. Force Developments. Soviet research and development on ICBMs is a dynamic process involving several programs. 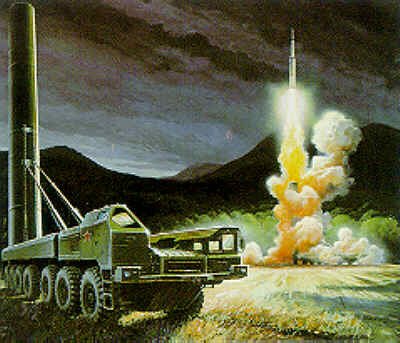 Deployment of the SS-25 marks a significant point of departure in Soviet ICBM developments, featuring solid propellant missiles and mobile basing modes. Modernized versions of or new replacements for the SS-18 are likely to be deployed in existing silos through the end of the century. Indeed, one new ICBM to replace the SS-18 has entered flight test. The Soviets appear to be planning on new solid-propellant ICBMs to meet many future mission requirements. They already have two new solid-propellant ICBMs the single-warhead, mobile SS-25 described above, now being deployed, and the SS-X-24. The SS-X-24 about the same size as the US Peacekeeper - is well along in its flight-test program. 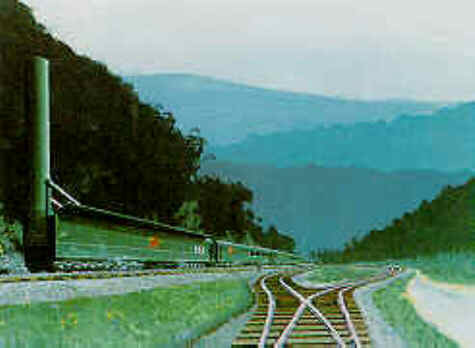 The SS-X-24 deployment in a rail-mobile mode is expected to begin in 1987, with silo-based deployment soon thereafter. Follow-on missiles to the SS-X-24 and SS-25 are anticipated. Both of these missiles are likely to have better accuracy and greater throw-weight potential than their predecessors. The SS-25 follow-on could be developed as a MIRV. Such a development would further expand the already large warhead inventory possessed by the Soviets. 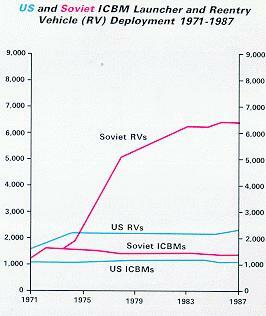 By the mid-199Os the current Soviet ICBM force will have been almost entirely replaced with new systems. The Soviets maintain the world's largest ballistic missile submarine force. As of early 1987, the force numbered 61 SSBNs carrying 916 nuclear-tipped missiles. The missile total does not include the six accountable missiles deployed on a GOLF III ballistic missile submarine (SSB) or the six on a HOTEL III SSBN. Neither total includes the 13 older GOLF II Class SSBs with 39 missiles, which are currently assigned theater missions. Twenty-one SSBNs are fitted with 352 MIRVed SLBMs. These 21 units have been built and deployed within the past 10 years. Two-thirds of the ballistic missile submarines are fitted with long range SLBMs, including those equipped with MIRVed missiles, thereby allowing the submarines to patrol in waters close to the Soviet Union and be protected from NATO submarine warfare operations. Moreover, the long-range missiles would allow the Soviets to fire from home ports, if necessary, and still strike targets in the US. Five units of the modern Soviet ballistic missile submarine class, the TYPHOON, have already been launched. Each TYPHOON carries 20 SS-N-20 solid-propellant, MIRVed SLBMs. The TYPHOON is the world's largest submarine, with a displacement approximately one third greater than that of the US Ohio-Class. It can operate under the Arctic Ocean icecap, adding to the protection afforded by the 8, 300 kilometer range of its SS-N-20 SLBMs. Two or three additional 25,000-metric ton TYPHOONs are probably under construction and will be operational by the early 1990s. The Soviets since 1978 have removed 15 YANKEE I units from service as ballistic missile submarines by dismantling their launchers. These units were removed as newer submarines were produced in order for the overall Soviet SSBN force to stay within the 62 modern SSBN/950 SLBM limits established in 1972. Some have been reconfigured as attack or long-range cruise missile submarines. 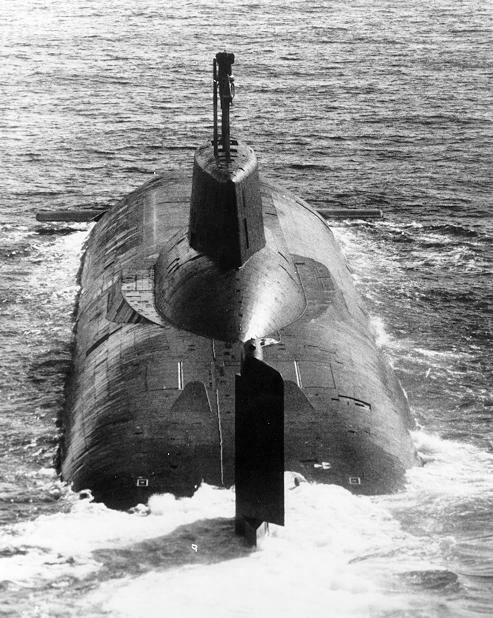 In a widely reported accident, the Soviets lost a YANKEE-Class SSBN in the Atlantic near Bermuda in October 1986. The ship suffered serious structural damage as a result of an explosion, presumably of volatile missile fuel. The loss of this unit had a negligible impact on Soviet strategic forces. Force Developments. The Soviets have launched four units of a new class of SSBN, the DELTA IV, that are fitted with the SS-N-23 SLBM. This large, liquid-propelled SLBM will have greater throw-weight, carry more warheads (10 rather than 7), and be more accurate than the SS-N-18, which is currently carried on the DELTA III-Class SSBN. Up to two more DELTA IVs are under construction. A new class of submarines is likely to enter the force in the early 1990s. The Soviets will probably begin flight-testing a modified version of the SS-N-20. Additionally, based on Soviet practice, a modified version of the SS-N-23 will probably be developed early in the next decade. The modified versions of these SLBMs are likely to be more accurate and possess greater throw-weight than their predecessors, and they may eventually provide the Soviets with hard-target capable SLBMs. To ensure communications reliability, the Soviets have deployed an extremely-low-frequency (ELF) communications system that will enable them to contact SSBNs under most operating conditions. Additionally, they have a specially equipped BEAR airframe, the BEAR J, that can perform a similar mission using VLF communications. The five air armies subordinate to the Supreme High Command (VGK) that contain the Soviet strategic bombers and strike aircraft are Smolensk, Legnica, Vinnitsa, Irkutsk, and Moscow. The strike assets of the air armies include some 165 operational BEAR and BISON bombers, 160 BACKFIRE bombers, 405 medium-range BLINDER and BADGER bombers, and over 450 shorter range FENCER aircraft. The Soviets have allocated these aircraft among five air armies to cover specific theaters of military operations (Europe, Asia, and the US) and yet retain the flexibility to reallocate aircraft as necessary during wartime. The Moscow air army contains the intercontinental BEAR and BISON bombers that could be made available for maritime and Eurasian missions, further underscoring the flexibility of Soviet strategic aviation forces. Some 130 BACKFIRE and 240 BADGER bombers are in Soviet Naval Aviation. Moreover, some 530 tanker, reconnaissance, and electronic warfare aircraft are in the air armies and Soviet Naval Aviation. 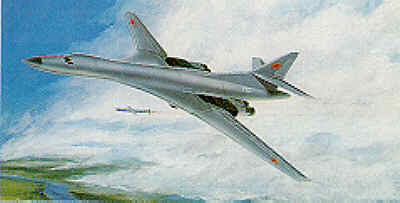 The Soviets are upgrading their long-range bomber force. The new BEAR H bomber, carrying the AS-15 long-range cruise missile became operational in 1984. Over 50 of these aircraft are now in the inventory. 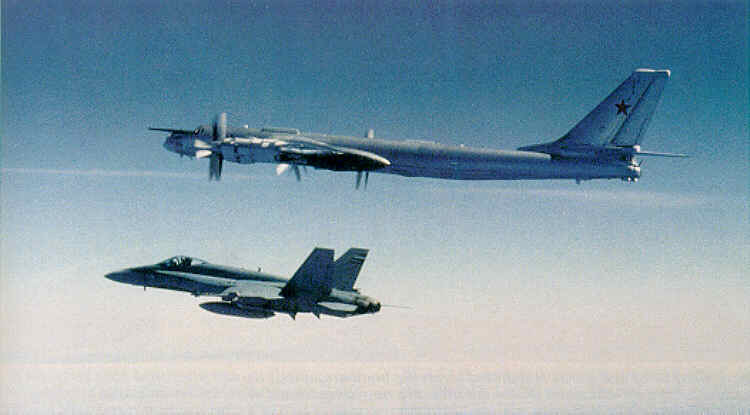 BEAR H bombers have been observed in training flights simulating attacks against North America. BEAR H is the first new production of a strike version of the BEAR airframe in over 15 years.Additionally, the Soviets are reconfiguring older BEAR aircraft, which carry the subsonic AS-3 air-to-surface missile (ASM), to carry the newer supersonic AS-4. About 40 of these reconfigured aircraft, known as BEAR Gs, are operational. The Soviets continue to produce the BACKFIRE, the most modern operational bomber in their inventory, currently at a rate of about 30 per year. Some are used to form new active units; others are used as replacements in existing units. The production rate is likely to be maintained at least through this decade. Several modifications have been made and more are likely to be made to upgrade performance. The BACKFIRE can perform various missions, including nuclear strike, conventional attack, antiship strike, and reconnaissance. Its low altitude dash capabilities make it a formidable platform to support military operations in Europe and Asia. Additionally, the BACKFIRE can be equipped with a probe to permit inflight refueling so that it can be used against the continental US if sufficient tankers are available. Force Developments. The BLACKJACK, a new long-range bomber larger than the US B-1B, is still undergoing flight-testing. 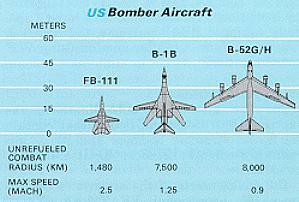 The BLACKJACK will probably be faster than the B-1B and may have about the same combat radius. The new bomber will be capable of carrying cruise missiles, short-range missiles, bombs, or a combination of each, and could be operational as early as 1988. It will probably be used first to replace the much less capable BISON bomber and then the BEAR A bomber. The Soviets have started deploying the MIDAS, an aerial-refueling tanker version of the CANDID transport aircraft. The new tanker will probably be used to support defensive as well as offensive operations and will significantly expand the ability of the Soviets to conduct longer range missions. The BLACKJACK bomber, still undergoing flight-testing, will also carry nuclear-armed AS-15 cruise missiles for its strike and reconnaissance role in a nuclear war. The AS-15, a small, air-launched, subsonic, low-altitude cruise missile, became operational in 1984. It is similar in design to the US Tomahawk and has a range of about 3,000 kilometers. It is currently deployed with the BEAR H and is expected to be carried on the BLACKJACK when that aircraft becomes operational. The BEAR H and eventually the BLACKJACK, in combination with the AS-15, provide significantly increased Soviet capabilities for strategic intercontinental air operations. A sea-launched version and a ground-launched version of the AS-15 are under development. The ground-launched cruise missile variant, the SSC-X-4, will probably become operational this year. Its mission will be to support theater operations in the Eurasian theater because the Soviets are unlikely to deploy it outside the USSR and because its range is too short for intercontinental strikes. The SSC-X-4 is being developed as a mobile system and will probably follow operational procedures similar to those for the SS-20 LRINF system. The sea-launched variant, the SS-NX-21, is small enough to be fired from standard Soviet torpedo tubes. VICTOR and specially configured YANKEE submarines are the most likely launch platforms for the SS-NX-21; other less likely candidates are the AKULA and SIERRA. The SS-NX-21 is expected to become operational soon and could be deployed on submarines that will patrol off the US. In addition to the SS-NX-21 small, long-range cruise missile system, a larger sea-launched cruise missile is under development. 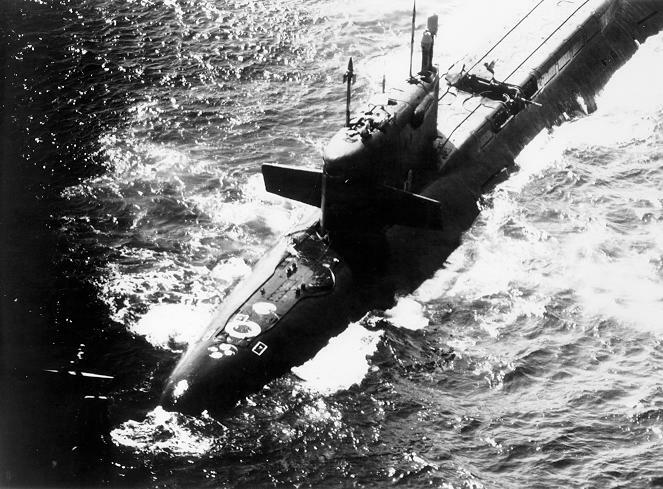 This missile, designated the SS-NX-24, has been flight-tested from a specially converted YANKEE-Class nuclear-powered cruise missile attack submarine (SSGN). It could become operational by 1988. A ground-based version of this missile may be developed. These cruise missiles will be equipped with nuclear warheads and will be capable of attacking some hardened targets. Future variants could be accurate enough to permit the use of conventional warheads, depending on munitions developments and the types of guidance systems incorporated in their designs. - 192 Trident (C-4) fleet ballistic missile launchers. The historic and continuing objective of US strategic forces is deterrence of nuclear and conventional aggression against the US, its allies, and friends. This policy has preserved peace since World War II and is based on the conviction widely held in the US that no winners would emerge from a nuclear conflict. The US does not have a strategic first-strike policy. Moreover, the US has no plans to adopt a first-strike policy. Rather, our deterrence policy seeks to maintain the situation in which any potential aggressor sees little to gain and much to lose by initiating hostilities against the US or its allies. To realize these deterrence objectives requires the development, deployment, and maintenance of strategic forces whose size and characteristics clearly indicate to an opponent that politico-military objectives cannot be achieved through employment of nuclear weapons or through political coercion based on nuclear advantages. In the Strategic Defense Initiative, the US is now investigating the potential over the long term of basing deterrence increasingly on defensive systems. The Soviets began a vigorous effort to modernize and expand their intermediate-range nuclear force in 1977 with the deployment of the first SS-20 LRINF missiles. 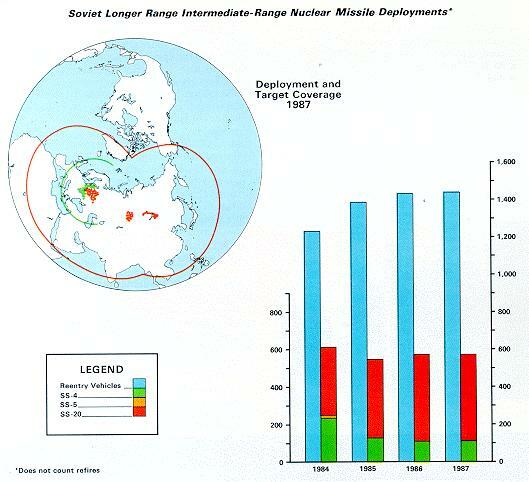 Because each SS-20 is equipped with three MIRVs, Soviet LRINF missile warheads have more than doubled since 1977. The SS-20s also have significantly greater range and accuracy and a much shorter reaction time than the missiles they have replaced. The Soviets have deployed 441 SS-20 launchers west of the Urals and in the Soviet Far East during 1984, the Soviets began construction of more bases for the SS-20 than in any other year. Some of this construction was to assist the relocation of SS-20 units that had been displaced from their former bases. The former SS-20 bases have now been converted to accommodate the SS-25 mobile ICBM. The mobility of the SS-20 system, unlike the older, fixed-based SS-4, allows it to operate under both on- and off-road conditions As a result, the survivability of the SS-20 is greatly enhanced because of the difficulty in detecting and targeting this system when it is field deployed. Further, the SS-20 launcher can be reloaded and refired, and the Soviets stockpile refire missiles. The Soviets are flight-testing an improved version of the SS-20, which is expected to be more accurate than its predecessor. In addition to the SS-20s, the Soviets maintain 112 SS-4 LRINF launchers. All of these are located in the western USSR opposite European NATO. NATO's initial deployment of Pershing IIs and ground-launched cruise missiles (GLCMs) began in Europe in late 1983. The number of LRINF missiles deployed in Europe by 31 December 1986 totaled 316 single-warhead missiles on 160 launchers. These consist of 108 Pershing II missiles on 108 launchers and 208 GLCMs on 52 launchers. In 1985, a brigade in the Belorussian Military District became the first operational unit to receive the SS-23 shorter range INF missile. The SS-23, with its 500-kilometer range, is a marked improvement in range and accuracy over the 300-kilometer SS-lc/SCUD B surface to-surface missile it is replacing. 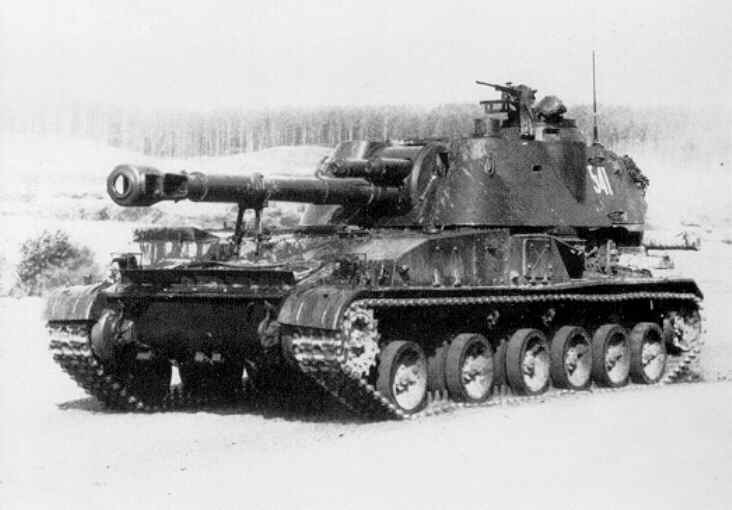 If the SS-23 follows the same sequence of deployment seen with the SCUD B, the western military districts will receive it first, followed by the Group of Soviet Forces, Germany. The SCALEBOARD, another Soviet SRINF system, has a range of 900 kilometers. Each front commander also may have a brigade of 12 to 18 new SCALEBOARD launchers available, which are more accurate than the older SCALEBOARDs they replaced. Over 60 SCALEBOARD launchers are opposite European NATO. In 1984, the Soviets forward-deployed the SCALEBOARD ballistic missile to Eastern Europe. These front-level weapons, which normally accompany Soviet combined arms formations, are now in position to strike deep into Western Europe. Forty SCALEBOARDs are along the border with China. A battalion is opposite Southwest Asia and eastern Turkey, and one battalion is maintained in strategic reserve. Because of their greatly increased accuracy, these new missiles can also be employed with nonnuclear warheads. Soviet armies and fronts have missile brigades equipped with 12 to 18 SS-lc/SCUD launchers. More than 500 are located opposite European NATO, and over 100 are along the border with China and in the Far East. Additionally, about 75 are opposite Southwest Asia and eastern Turkey, with over 25 launchers held in strategic reserve. Various SNF consist of tube artillery and missiles of much shorter range than INF. These SNF assets are available to the Soviet division commander. The most prominent such systematic division level is the unguided free-rocket-over-ground (FROG), which is deployed in a battalion of four launchers. The Soviets are replacing FROGs with the more accurate, longer range SS-21s in some divisions opposite NATO. About 500 FROG and SS-21 launchers are opposite NATO. Another 215 FROG launchers are opposite China and in the Far East; some 100 are opposite Southwest Asia and eastern Turkey; and about 75 are in strategic reserve. Nuclear-capable artillery tubes are also available to front commanders. Three newer self-propelled, nuclear-capable artillery pieces are being added to the inventory: a 152-mm gun (which also has a towed version), a 203-mm gun, and a 240-mm mortar. When fully deployed, these new nuclear-capable artillery tubes plus older 152-mm howitzers that are also capable offering of nuclear rounds will exceed 10,000. The Soviet Union will maintain its substantial numerical superiority in shorter range INF and SNF systems while improving the qualitative characteristics of its forces. The USSR also has a significant numerical advantage in INF aircraft and is reducing the qualitative advantage NATO has held. This development is taking place despite NATO's INF aircraft modernization program, in which older aircraft are being replaced by the F-16 and Tornado. Force Developments. As in all other nuclear attack forces, the Soviets will probably continue to seek ways to improve the capabilities of their tactical missiles and nuclear artillery. These improvements will be accomplished through incremental modernization of existing systems as well as through the introduction of entirely new systems. The Soviets probably will also work to upgrade their shorter-range ballistic missile force. Advancements in warhead capabilities, accuracy, and reliability are likely and tests could begin soon. Combined arms commanders would then have enhanced non-nuclear targeting options and more flexible and survivable ballistic missile assets. These systems will be capable of delivering nuclear, chemical, or conventional warheads closer toward the forward edge of the battle area and to greater depth within the military theater of operation. The US SNF is made up of Lance tactical missiles and nuclear artillery. Although SNF artillery was once an area of NATO advantage, the balance has shifted in favor of the Soviets in recent years. Sea-Based Forces. The Soviets operate 13 GOLF II-Class ballistic missile submarines equipped with 3 SS-N-5 SLBMs each. Six GOLF IIs are assigned to the Baltic, where they pose a threat to most of Europe, while the remaining seven are based in the Sea of Japan, where they can be employed against targets in the Far East. The Soviet Navy also maintains an extensive sea-based non-strategic nuclear force comprising both antisurface warfare (ASUW) and antisubmarine warfare (ASW) as well as land attack systems. The Soviets maintain an inventory of nuclear-armed torpedoes as well as ASW depth bombs; the newest versions of both entered service in the early 1980s. The Soviet Navy also deploys an extensive array of ASUW and ASW cruise missile systems, ranging from the SS-N-3 to the newer SS-N-19 and SS-N-22; the latter two were also introduced in the early 1980s. Some 288 surface warships, 340 submarines, and about 30 other combatant ships carry at least one of these systems. US sea-based non-strategic programs include continued production of the Tomahawk nuclear armed land-attack cruise missile and development of a nuclear depth/strike bomb (NDSB). The Tomahawk provides increased range over carrier aircraft and allows dispersal of nuclear strike assets over a large number of naval platforms. The NDSB, combining land-attack and ASW features in a single bomb, will replace the aging nuclear bombs currently fulfilling this mission.